Image credit: NOAA/National Centers for Environmental Information (NCEI). Records show that the earth in 2018 had its fourth-highest average surface temperature in almost 140 years, according to the announcement last week by NASA scientists. Tracking the data shows a clear and persistent upward trend over 14 decades. According to the history as documented, the five warmest years have been the last five years. Since 2001, the planet has undergone 18 of the 19 warmest. The long, 140-year journey up to our current temperatures has sped up in the last 20 years, confirming the scientific consensus that human activity is causing the uptick. It is this most recent period, and its record rise in levels of carbon dioxide and methane, which confirms that it is no longer “tomorrow” that is of concern. 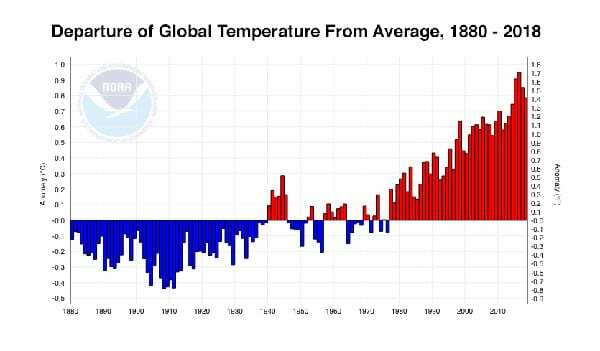 NASA’s temperature data and that of the National Oceanic and Atmospheric Administration, or NOAA, came out together. (This year’s global temperature reports were delayed, as scientists from NOAA and NASA were prevented from completing the analysis of the data by the government shutdown.) They use marginally different procedures to calculate the overall temperature changes and have disagreed once or twice on rankings by a year, but both agree that 2018 was the fourth-warmest year. Scientists caution that to avoid the worst consequences, the earth’s overall temperature cannot rise over 2 degrees Celsius from where it was in the beginning years of the Industrial Revolution. Measuring from that 19th century mark to 2018, the earth is now registering over 1°C higher. The report provides nonprofits with red flags and warning signs, relating to the work they are doing, and how they may have to change. Nonprofit Quarterly has written on how climate change will affect nonprofits—public health concerns; how the ability to get food globally will be affected by drought in some places and floods in others; and a possible increase in refugees escaping harsh conditions. Nonprofits are already including climate change in their missions as they deal with coastal flooding in the United States from destructive hurricanes like Florence and Michael and shrinking Arctic ice and mountain glaciers. The polar vortex pushed Midwest communities to close colleges and schools for days at a time. And, in the rebuilding of Puerto Rico after 2017’s hurricane, attention is being paid to resilience. Dr. Schmidt speaks of a downhill slide that the earth is on, rather than a sudden crisis cliff. Scientists believe it can still be slowed with great effort, and perhaps reversed over time. From the data gathered, though, the 2-degree line will be crossed even with over 190 countries participating in lowering the greenhouse emissions through the Paris Climate Agreement. Even half a degree more will have calamitous consequences. The journal, Nature, published two new studies which propose that the melting polar ice caps could bring more punishing weather. Tamsin L. Edwards, a climate scientist at King’s College London and leader on the first study, which is focused on the impact of Antarctic ice-shelf collapse, estimates that the sea level rise would be near 10 inches, and predicts 5 to 6 feet in 80 years—just a lifetime. In the other study, Nicholas Golledge, associate professor at Victoria University of Wellington’s Antarctic Research Centre in New Zealand, demonstrates that fresh water sloughing off of Greenland’s melting will affect the Atlantic Ocean’s circulation, bringing warmer water to hurricane alley’s Gulf of Mexico.